*1 N-55 (S), Q-85 or S-95 is designed for i-stop system (FOR STOP & START)/i-ELOOP system. Only N-55 (S), Q-85 or S-95 should be used to ensure correct operation of i-stop system (FOR STOP & START)/i-ELOOP system. Consult an expert repairer, we recommend an Authorised Mazda Repairer for details. *2 Not for i-stop system/i-ELOOP system. *2 The spark plugs provide the SKYACTIV-G its optimum performance. Consult an expert repairer, we recommend an Authorised Mazda Repairer for details. When cleaning the iridium plugs, do not use a wire brush. The fi ne particulate coating on the iridium alloy and platinum tips could be damaged. *1 Refer to the recommended SAE viscosity numbers on page 6-23 . *2 Mazda Original Oils are specially designed/tested for the respective engine. For optimum performance we recommend to use Mazda Original Oils at all times. *3 If you are unable to fi nd a Mazda Original Oil, alternative oils meeting the listed specifi cation may also be used. 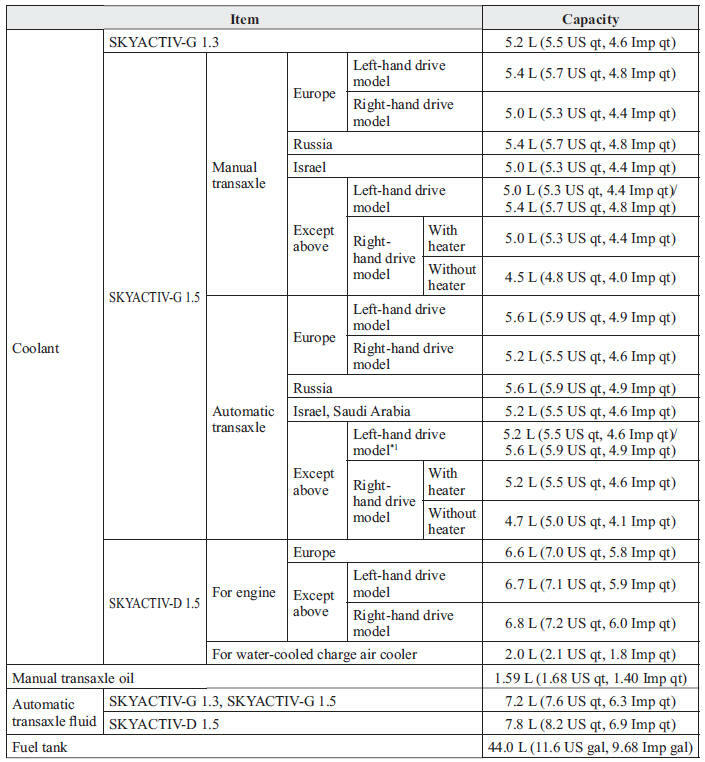 *4 For African nations, use SL or higher engine oil with the SKYACTIV-G 1.3 and SKYACTIV-G 1.5 LP (Low- Power) engines. Do not use oils which do not meet the above specifi cation or requirements. Use of unsuitable oil may lead to engine damage which is not covered by the Mazda Warranty. *1 (Except European models) Use FMVSS116 DOT-4 brake fl uid for vehicles equipped with the SKYACTIV-D 1.5 engine and drum type rear brakes. Check oil and fl uid levels with dipsticks or reservoir gauges. *1 The engine coolant amount varies depending on the specifi cation. 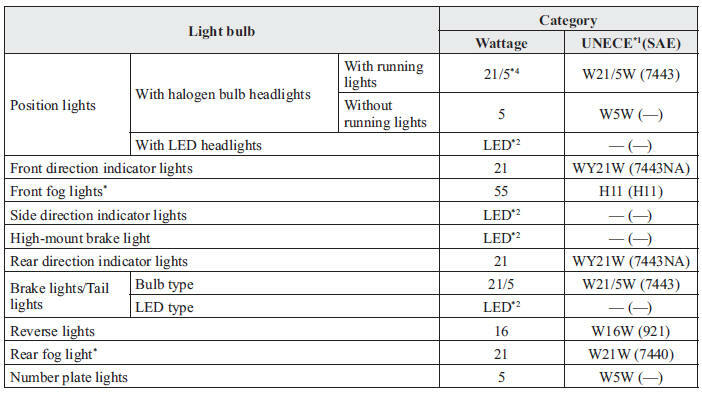 *3 Double-fi lament light bulb, however, only 21 W fi lament bulb is used in the running lights. *4 Double-fi lament light bulb, however, only 5 W fi lament bulb is used in the position lights. Choose the proper tyres for your vehicle using the following tyre mark information. The tyres have been optimally matched with the chassis of your vehicle. When replacing tyres, Mazda recommends that you replace tyres of the same type originally fi tted to your vehicle. For details, contact an expert repairer, we recommend an Authorised Mazda Repairer. Check the tyre pressure label for tyre size and infl ation pressure (page 6-44 ). After adjusting the tyre pressure, initialization of the tyre pressure monitoring system is necessary to make the system operates normally. *1 Check the tyre inÀ ation pressure label (driver's door frame ) for the correct tyre inÀ ation pressure. Refer to Tyre Pressure Label on page 9-3 . Refer to Fuses on page 6-61 . If you require information regarding the wear limit specification for the brake disc plates and drums, or the measurement method, please contact an expert repairer, we recommend an Authorised Mazda Repairer. The information is made freely available.